After what seems like years to them, the folks at Chilbolton are now reaching the final stages of the HBA cable installation. 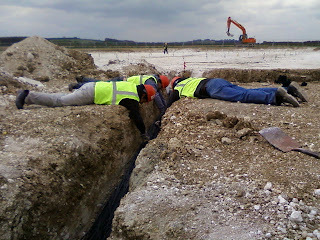 However, everyone is acutely aware that the LBA (with its labyrinthine trench network) awaits us and time is pressing. Dave King gathers the strands within the cable grave. 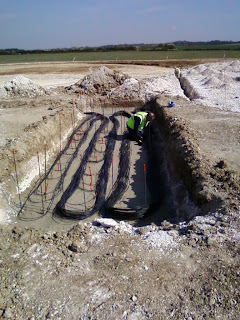 This extra-wide trench is used to take up the slack from the fixed length cables. Richard Armstrong gazes down into the abyss... well, maybe just the last trench where the entry points to the RF-container ducting are. From here, pairs of cables are gathered and passed down for feeding into the ducts. Well, if Richard was gazing into the abyss, then Chris Caddell is in it! Here, Chris sends the cables through the ducts to the patch panels for final termination. With the cables patched, it is then time to clear the trenches and gather the cables prior to covering with sand and backfilling. 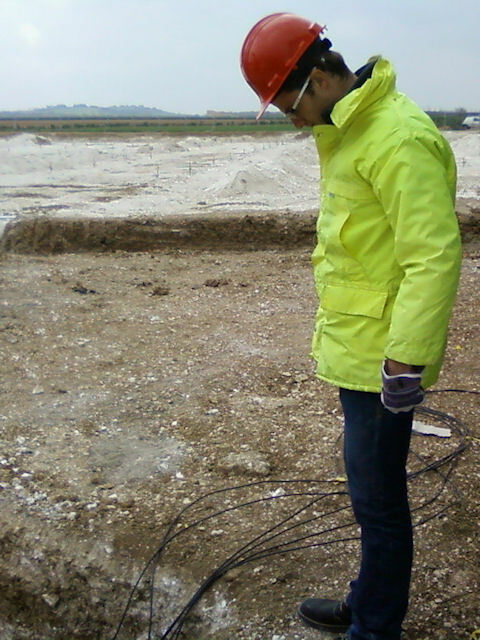 In particular, the trench must be free of any flint which can easily cut into the cable. This is not easy, especially in the final trench where all the cables are present and crowd one another. As this photo shows, the cable crew are obsessed about achieving a perfect job. From left to right: Jack Hickish, Chris Caddell and Kahinde Johnson.